Just like that, a flotilla of NASA spacecraft has plumbed one of the deeper mysteries of space physics: what causes “magnetic reconnection,” the process that allows energy from the sun’s magnetic field to leak into Earth’s, triggering potentially damaging space weather. After only a few months in orbit, the four spacecraft of the Magnetospheric Multiscale (MMS) mission flew through a region of space where reconnection takes place and measured—for the first time—the movement of the electrons thought to be responsible for the phenomenon. Many astronomical bodies such as planets, stars, and—in principle—black holes have magnetic fields. These fields typically have the same applelike shape as that of a bar magnet: The imaginary “lines” that trace the field emerge from the magnet’s south pole, looping northwards through space and plunging back into magnet’s north pole. (On Earth those north and south magnetic poles are almost aligned with the north and south geographic poles.) Charged particles like electrons and ions spiral along the field lines. The fields occasionally produce explosive outbursts, such as the sun’s solar flares and colossal flares from highly magnetic pulsars known as magnetars, which are far more powerful than supernovae. The source of these explosions is thought to be magnetic reconnection. That phenomenon occurs where opposing magnetic fields from different sources meet, such as at the magnetopause, the boundary in space at which the sun’s field pushes against the Earth’s. Ordinarily, that boundary acts as a shield for Earth, deflecting the stream of high-energy charged particles coming from the sun, the solar wind. But reconnection opens rifts in Earth’s magnetic defenses, allowing solar particles to pelt the planet. Where opposing magnetic fields meet, the field lines are like adjacent train tracks with particles moving along them in opposite directions. Occasionally, however, field lines break and the loose ends reconnect with the oppositely directed ones to create two new field lines with hairpin bends. This produces “magnetic field lines with one foot on the sun and one on Earth,” says Burch. “It lets all that solar energy flow right in.” The process also energizes particles already spiraling in the field, Yamada says. Thus reconnection at Earth’s magnetopause can cause destructive space weather that can damage satellites, threaten the health of astronauts, and disrupt communications and energy grids on the surface. Scientists have struggled to understand exactly how reconnection works. In lab experiments, the phenomenon happens so quickly and on such small scales that it is hard to study. In space is better, but it happens at unpredictable times and locations. 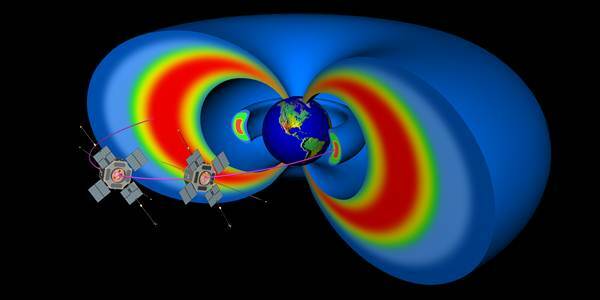 Earth’s magnetopause “is the only place you can do this,” Burch says. Some probes have sought to measure reconnection there, such as the European Space Agency’s four-spacecraft Cluster mission. But those spacecraft lacked instruments sensitive enough to pin down the movement of electrons, which are thought to be crucial. In the MMS mission, each of the four identical spacecraft has numerous instruments measuring magnetic and electric fields as well as the motion of ions and electrons. Launched in March 2015, the craft began gathering data late that summer, flying in a tetrahedral formation 10 kilometers apart. In 6 months they made 4000 passes through the magnetopause. But on 16 October they got lucky with the four craft flying right through a region where reconnection was in progress. They had another five direct encounters after that. As the MMS team reports today in Science, instead of the turbulent swirling of electrons that some theorists had predicted, researchers found that the electrons moved in a more concerted way, meandering back and forth across the magnetopause. This concerted flow of electrons constitutes an electric current which in turn creates a magnetic field across the gap, perhaps providing the spark which causes the opposing fields on either side to break and reconnect. At the same time, an electric field aligned along the current is responsible for converting magnetic into kinetic energy, firing out particles like a slingshot. Burch says this mechanism for accelerating particles is the “smoking gun” for reconnection in action, although researchers have yet to pin down the source of the electric field. In the coming months, they hope to encounter more reconnections with the spacecraft just 5 kilometers apart, to get a finer grained picture. Previously, computer simulations were always ahead of reconnection experiments, Burch says. Now that’s reversed. “Those [theory] guys are scrambling to explain this,” he says. Be the first to comment on "New satellite to study space weather"